The first rumours of low temperature nuclear fusion were spread by Friedrich Paneth and Kurt Peters in 1927. Nowadays we know that around that time the Swedish scientist John Tandberg tried to get a patent because of experiments that showed him the nuclear origin of the released energy. However, cold fusion is widely known since the sensational experiments of the British chemist Martin Fleischmann and the American-French electro chemist Stanley Pons, announced in 1989. Unfortunately, the scientific community ridiculed their discovery because the phenomenon couldn’t be clarified by theoretical physics. In spite of this, the research in the field of low energy nuclear fusion (LENR) continued. For example, see the list of publications of the International Society for Condensed Matter Nuclear Science (http://www.iscmns.org/CMNS/publications.htm). The experiments of Fleishmann and Pons – nuclear fusion by the electrolyse of heavy water with the help of Palladium electrodes – were successful but hard to replicate. 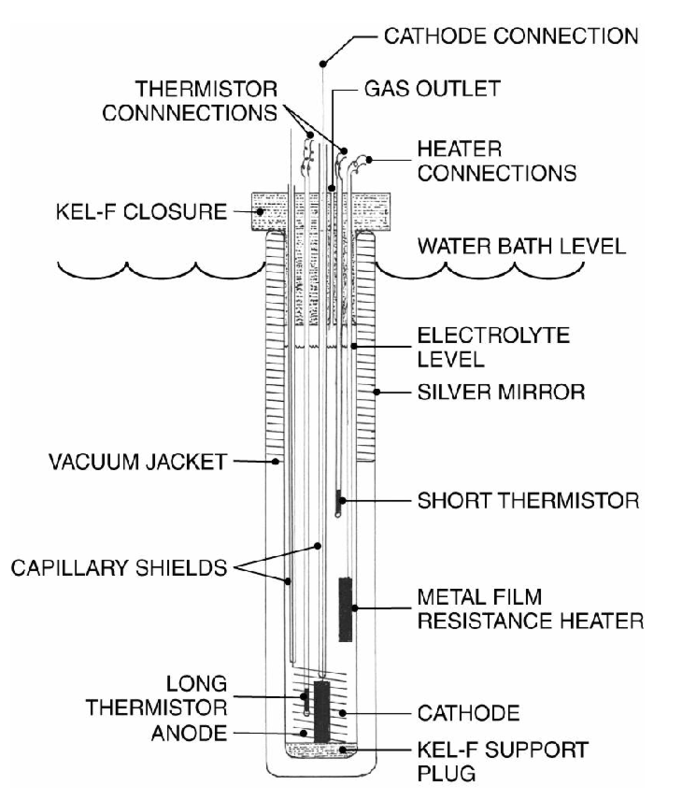 The image (3) below shows a schematic representation of a calorimeter that is nearly similar to the calorimeter used by Fleissmann and Pons (source: Wikipedia). 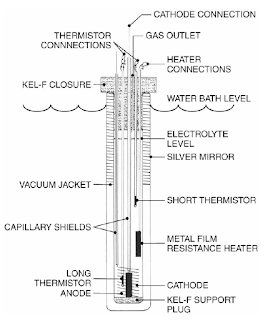 The liquid is an electrolyte in heavy water and the cathode is plated with Palladium. With the help of a DC current to split the heavy water, the Palladium at the cathode get hydrated by 2H-atoms what can result in a fusion of adsorbed Hydrogen ions/atoms beneath the surface of the Palladium lattice. The phenomenon of the bursts of exceptional heat during the electrolyse of heavy water with the help of Palladium electrodes is not simple to control, perhaps because the conductivity of Palladium hydride depends on the local amount of Hydrogen adsorption within the lattice. Besides that, the structure of the Palladium lattice seems to be important to get reliable results. Anyway, cold fusion with the help of a Palladium lattice has no bright future because palladium is a precious element and there is not enough Palladium to be find in the crust of our planet to establish cold fusion as the main source of thermal energy. And, last but not least, the cold fusion process within a palladium lattice produces not only 2H, 3He and 4He atoms; there are also residue’s of Fe, Cr, Ni, and Al by the fission of Palladium nuclei. Thus there is nuclear decay and harmful radiation too (see ISCMNS volume 13, page 442: “It is not low energy – but it is nuclear”, by Pamela A. Mosier-Boss). Besides that, nuclear fission will ruin the Palladium lattice so it will become impossible to "refuel" the reactor with Hydrogen atoms. Anyway, “cold fusion” has showed to be real in many, many experiments, albeit it is difficult to transform the phenomenon into a widely available – and manageable – source of nuclear thermal energy. That’s because there is no accepted scientific theory of the origin of cold fusion. The last post showed a theoretical explanation about the role of the Coulomb force in relation to the fusion of Hydrogen nuclei within a (Palladium) lattice. “Cold” fusion is only possible when Hydrogen nuclei are locked within a lattice, so a dense electromagnetic wave can influence the Hydrogen nuclei. This mechanism will decrease the normal strength of the Coulomb force because the affected nuclei will expand their boundary. The energy of the fusion of Hydrogen nuclei within a metal lattice can trigger the fission of the enclosed nuclei of the atoms of the lattice. It is possible to avoid fission when we use a metal lattice with a lower atom number. Unfortunately, this solution is only possible at high temperatures and pressure (only Palladium has the right properties to adsorb plenty of Hydrogen atoms at room temperature). Thus we have to admit that a simple and manageable small-scale cold fusion reactor can’t be some kind of “replication” of the metal lattice experiments by Martin Fleissmann and Stanley Pons. To fuse 2 Hydrogen nuclei it is necessary that both nuclei are close together. In other words, without the help of a metal lattice it is not advisable to favour solutions with the use of Hydrogen gas. The consequence is the choice for a chemical bond of 2 – or more – Hydrogen atoms together with 1 or more immediating atoms that hold the Hydrogen atoms. 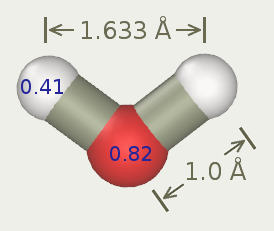 For example, like the image below (H2O). The final molecule – the replacement of the Hydrogen atoms – has to be enclosed by a solid to “secure” the motions of the Hydrogen atoms. Moreover, the enclosed molecule has to be exposed to a dense electromagnetic wave pattern to force the Hydrogen nuclei to expand their boundary. Electromagnetic waves move with the speed of light and the involved energy transport is Planck’s constant, multiplied with the number of wavelengths (E = v h). Therefore, it is hard to imagine that “single” electromagnetic waves can establish the expanding of the boundary of secured Hydrogen nuclei. However, a free electron is an electromagnetic wave pattern that represents a measurable amount of mass. Thus it has a far higher energy density in relation to single electromagnetic waves, although the energy of a single free electron is not enough to establish fusion of Hydrogen nuclei. When we want to apply a dense wave pattern to Hydrogen nuclei we have to use some kind of manipulation with the help of an electric current to concentrate free electrons. It is not easy to find a solution to incorporate all these specific properties – mentioned above – within a simple design of a small-scale LENR reactor. Nevertheless, I give it a try.